When Graco announced their first 4-in-1 car seat, the Graco 4Ever, I was equal parts suspicious and intrigued at the notion of a car seat that has 4 modes: rear facing, forward facing, high back booster, and backless booster. A lot of the time, multimode car seats tend to fall short in at least one of the modes. It’s no small task to make a car seat that’s suitable for children who range from a 4 pound newborn all the way up through an 80 pound 10 year old. We’re pleasantly surprised that for the most part, Graco has accomplished this with the 4Ever! Forward facing weight range: 22-65 pounds (seats made before 2015 may have a lower minimum weight; always follow the manual that came with your seat). The 4Ever arrives mostly ready for a newborn to use. HOWEVER. The cupholders require assembly before the seat can be used. Directions for assembling the cupholders are in the manual — they slide into a channel and click into place. Once assembled, the cupholders are required to remain attached to the seat. The people at Graco clearly have listened to feedback about the Smart Seat, their last attempt at a multimode restraint, and put a great deal of thought into the design of this seat. The 4Ever is as if a Snugride 30 Classic Connect, Size 4 Me, and a Nautilus 80 all came together to make a smooth, sleek, and fabulous baby. Like all Graco car seats and booster seats, the 4Ever comes with two separate manuals, in English and Spanish. The 4Ever boasts a ‘steel-reinforced frame’. While we have no idea if this means it’s actually safer, we do know the trend in child restraint manufacturing is toward energy flow management, and not just retention in the car. The 4Ever has multiple recline positions. The first three are for rear facing mode. The second three are for forward facing mode. The 4th recline position MUST be used for a forward facing child who weighs between 20 and 40 pounds, and the 6th position must be used in booster mode. The recline adjuster glides smoothly, and is simple to use. There are no restrictions on which of the first three recline positions must be used in rear facing mode. The recline angle indicator on the side of the seat has a bubble which must be situated along a blue line. The bubble must be entirely on the line. If the bubble is more towards the back of the car, the seat is more reclined, which would be appropriate for babies without head and torso control. If the bubble is towards the front of the car, the seat is more upright, which would be appropriate for rear facers with head and torso control. In rear facing mode, the harness should be positioned at or below the shoulders, and the buckle should be in the position nearest to but not under the child. Either crotch buckle position may be used for either direction. In rear facing mode, the 4Ever is compact enough that it would work even in a small sedan. Rear facing size can be problematic with any seat intended to fit a child all the way through seat belt age. Graco clearly took this into account and came up with a fairly compact option in the 4Ever. As the head rest extends for taller rear facing toddlers and preschoolers, the 4Ever maintains its compact shape by extending up rather than back. The harness mechanism pulls quite smoothly and does not require significant strength to tighten. The roller bar at the back of the seat helps achieve this smooth pull. While the 4Ever has only one lower anchor strap, it has a unique system for moving the strap between belt paths that we now see on a lot of other Graco convertible and multimode car seats. The belt paths are color coded and match the relevant pages by color in the manual. The bottom of the seat is smooth and solid, designed to minimize the pressure marks that occasionally result on vehicle upholstery from a tightly installed seat. The 4Ever’s manual contains several references to the American Academy of Pediatrics recommendation that children under 2 should ride rear facing. In addition, NHSTA recommends that children 1-3 years continue to use a rear facing restraint as long as they fit by height and weight. CSFTL echoes this recommendation. A 40 pound 4 year old would be in the 80th percentile on the growth chart. We expect that the 4Ever’s tall shell can help almost every child ride rear facing until their 4th birthday. Installation itself was fairly straightforward. The 4Ever ships with the lower anchor connectors in the rear facing belt path. Secure the lower anchor connectors to the vehicle, and tighten to less than 1 inch of movement. The lower anchor connector strap was unusually short. I suspect Graco was trying to decrease the chance of installing a seat with the lower anchor strap through the wrong belt path, but that’s only conjecture on my part. The lower anchor connectors store in a handy compartment on the front of the car seat. Store them here before installing the 4Ever with the vehicle seat belt. Thread the vehicle seat belt through the rear facing belt path. The belt path is an open design, which allows easy threading, no scraped knuckles, and quick access for tightening the shoulder belt. Here you can see the access slot in the seat pad. Compare the 4Ever with the Graco My Size, which is known for being compact. The vehicle is a 2013 Grand Caravan. At the most reclined angle, the 4Ever offers about 3 inches of space to the front seats (moved all the way back), relative to the My Size’s 1 inch of space. Fully extended, the 4Ever continues to allow about 1.5″ of space. I was unable to completely extend the My Size headrest at the fully reclined angle. It struck the head restraint of the front passenger seat. With the impressive (very firm, not plush) insert in use, the bottom harness height is 6 inches. The crotch buckle is 4 inches from the seat back. These adjustments should combine to make the 4Ever fit most newborns reasonably well. The insert itself has a separate head and body support, with an adjustable elastic to raise the head support as the child grows. The insert must be used if the baby’s shoulders do not reach the harness position in the lowest headrest position. It may not be used in the forward facing position. The body support may be used without the headrest, but the headrest cannot be used without the body support. Graco rates the seat from 4 pounds. Many a car seat has made this claim but not all actually work for a preemie because the bottom harness height is still too high for their tiny shoulders. In the name of science, we put our preemie Huggable Images doll in the 4Ever and here’s what we found. Yes, indeed, that’s a 4 pound preemie fitting correctly and snugly in the 4Ever, with the harness coming out from just at her shoulders. Keep in mind that not all preemies have the same proportions, and just because it fits the Huggable Images preemie does not mean it will be suitable for all preemies. But we’re encouraged just the same. In rear facing mode, the newborn, 1 year old, and 3 year old dolls all fit well, with plenty of room for legs and comfortable buckling. The seat pan measures 12.5 inches deep. This model is 25 months old, weighs 22 pounds and 33 inches tall. She seemed comfortable and had plenty of leg room. The seat allows for rear facing to within 1 inch of the adjuster at the top, or a seated height of about 27 inches. With those limits, she’s got plenty of room to grow. The seat can be used forward facing with the five point harness for a child who is at least 1 year of age (CSFTL recommends rear facing to the maximum height or weight limits of the car seat), weighs between 20 and 65 pounds, and is under 49 inches tall. The highest harness position is 18 inches with the seat pad compressed. The seat must be used in the 4th, 5th, or 6th recline positions when forward facing. If the occupant is under 40 pounds, the recline angle must be in the 4th position (Note: This restriction is for the US only). The harness should be positioned at or above the shoulders and the buckle should be in the position nearest to but not under the child. The seat comes with the lower anchor connectors in the rear facing belt path. To move them to the forward facing belt path, loosen the harness and extend the head rest all the way. Then, unsnap the cover to expose the interior of the seat, then slide the lower anchor connectors along the interior bar into the forward facing belt path. This seat may only be installed with lower anchors for children weighing under 42 or 45 pounds, depending on when your 4Ever was manufactured. If your child maxes out the rear facing weight capacity, a forward facing installation would require the vehicle seat belt and top tether instead of lower anchors and top tether. 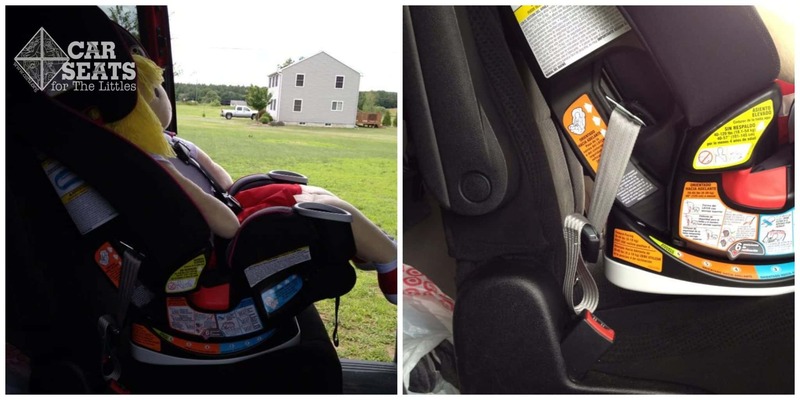 To install the seat forward facing with the vehicle seat belt for a child who weighs between 20 and 65 pounds, store the lower anchor connectors in the provided bars for the forward facing position and insert the vehicle seat belt through the belt path. Children who weigh between 40-65 pounds may be use recline positions 4, 5, or 6. Regardless of whether a forward facing install uses the lower anchors or the vehicle seat belt, always attach the top tether to the tether connector on the vehicle. We mentioned the tether, right? Always use it with a forward facing installation! The manual clearly states that the top tether is required for all forward facing installations. There is no option for installing the 4Ever without it. Here we see our 3 year old Huggable Images doll in the 4Ever installed at the required recline for a child who weighs less than 40 pounds. The 4Ever is quite reclined in this configuration. However, this Grand Caravan has very sloped seats; in vehicles with more level seats, the 4Ever may install more easily at the 4th recline position. Our 6 year old doll has about a half-inch of growing room in the torso. The live model is 6 years old. He weighs about 46 pounds, and is and 47 inches tall. He’s using the highest harness position and is just about out of room in harnessed mode. NHTSA recommends that children ages 1-3 continue to ride rear facing as long as they fit in their car seat by height and weight, and then use a forward facing 5 point harness. Children between 4-7 years old should continue to use their 5 point harness as long as they fit by height and weight, and then move to a belt positioning booster. We mention this because 3 year olds do not ever belong in high back boosters and yet the 4Ever’s manual lists 3 as the minimum age to use the 4Ever in booster mode. We encourage Graco to update this misguided low-end minimum on a seat that can certainly accommodate older children in the harness. The base must be set in the 6th recline mode for booster use. Once the child outgrows the harness, the 4Ever converts to a transitional booster seat that will last about another year or so. Graco devised a nifty system for harness storage in booster mode. The harness is never removed from the seat. Instead, it is tucked away in a little door behind the seat pad, guaranteeing that you don’t accidentally lose it. Extend the head rest, expose the interior of the seat, then open the door to store the harness. Buckle the chest clip but leave the buckle tongues unbuckled. Secure the harness pads, retainer clip and buckle tongues in the compartment behind the door, then shut it. Store the buckle itself in the compartment provided in the seat bottom. Graco permits use of lower anchors and top tether when using the seat in booster mode. As always, if you choose not to use this feature, be sure to buckle the booster in when not occupied, to prevent it from moving unhindered through the cabin in an accident. The booster mode fit both our 6 year old safety training doll, and our 6 year old not-doll well. The lap belt lies low on the lap, where it belongs, the belt moves freely through the shoulder guide and rests comfortably and correctly across the chest. Though the 4Ever lists a 57 inch maximum height in high back booster mode, it’s unlikely that a child who is 57 inches tall would fit in the seat. Our Huggable Images doll is 57 inches tall — the doll’s shoulders are above the highest shoulder belt guide position. Our 8 year old human model weighs 65 pounds and is 53 inches tall. Both the child and the doll’s shoulders far exceed the top booster position. In addition to continuing to use a harness to its capacity, CSFTL recommends backless boosters for older children who have outgrown their high backs, and do not need the support of a back to remind them to sit correctly, even when sleeping. Vehicle head support is required for backless boosters. To change the seat from high back booster mode to backless booster mode, detach the harness from the splitter plate behind the seat. Expose the seat under the pad, locate the two red tabs, rotate them upward, and then push them in together. Then simply lift the entire back off the bottom, harness and all, move the red tabs to their original position, and replace the seat pad. The splitter plate can be stored, and the pad now has two additional elastic tabs to secure it to the base. Tuck the remaining end behind the seat when in use. The interior of the seat sports a 15 inch seat pan. It has 14 inches of interior hip room. The backless booster has no LATCH option, so remember to buckle it in when not in use. For younger and smaller children, use the provided belt guide to correctly place the shoulder belt. For older children, the shoulder belt will likely fall in place on its own. Replacing the level indicator on the Graco 4Ever is a task that most families won’t have to tackle. But for the few who do, here’s a quick guide to this pretty simple process. Graco provides detailed instructions with the new level indicator. You will need a hand-held Phillips screwdriver and about 60 seconds of your time, possibly less. First: Locate the level indicator mounting screw, and remove it with the Phillips screwdriver. Keep the screw in a safe place, because you will need it again. Then, pull the left side of the indicator out of the shell, rotate the indicator, and pull the right side of the indicator out of the car seat’s shell. Throw the defective indicator away. Finally, insert the hook end (right side) of the new indicator in the hole of the seat, and rotate the left end into the shell. Align the holes and re-insert the screw. Do not over tighten the screw or the indicator could break. With those steps complete, the new indicator is installed and ready to keep on indicating your Graco 4Ever’s recline angle. Manual Storage: We love it when a manufacturer thinks about the little things – like where can you stow the instruction manual for easy reference whenever a question comes up?The 4Ever has a handy little storage pocket at the back of the seat’s base the manual. It’s even clearly labeled! FAA Approval: If you’re taking your 4Ever on an airplane to use in harness mode, a Flight Attendant may ask to see the FAA Approval label. It’s located on the inside of the pillar on the left side at the back of the seat. Please note that the label may be obscured if you’ve got a travel cart attached to the seat. Date of Manufacture Label: The Date of Manufacture label is located on the seat’s base, on the right side. It’s right next to the manual storage compartment. Locking Clip Storage: The locking clip is stored on the back of the seat, in the middle of the shell. CSFTL can give this seat a hearty and non-conditional thumbs up. It is easy to use, well designed, solid in feel, designed to be compatible in many vehicles, and will truly span a significant age range, from preemie on up. I will offer the caution that unless you have a giant, off the charts child (like my 9-year-old above), this cannot be the only seat you’ll need. Children generally need boosters until they are around 4 feet 9 inches to 5 feet, the size of a 10-12 year old. As the seat expires in 10 years, it will expire before most children are ready to ride in a seat belt alone. At $300 on Amazon.com, the 4Ever isn’t the lowest priced car seat on the market. However, if you divide the cost over 10 years, and you reasonably could use the seat over a 10 year period, you’re looking at a cost of $2.50 a month, which might make it seem a little more palatable. If you’re a family on a budget and simply cannot afford to spend quite that much at one time, this may not be the restraint for you. For a family who needs to transport different sized children, (for example, those who provide foster care, or child-minder services), this seat could cover all potential possibilities. For a family who wants to not think about car seats again for the next 10 years? This absolutely could fill that need. Graco graciously provided this 4Ever for review. Our opinions, as always, are entirely our own.